329. A piston-rod guide. 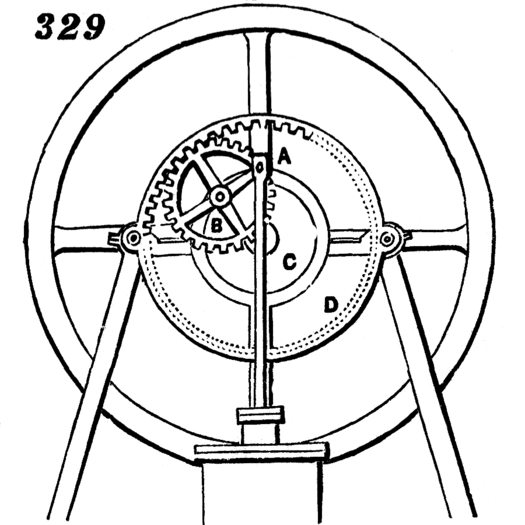 The piston-rod, A, is connected with a wrist attached to a cog-wheel, B, which turns on a crank-pin, carried by a plate, C, which is fast on the shaft. The wheel, B, revolves around a stationary internally toothed gear, D, of double the diameter of B, and so motion is given to the crank-pin, and the piston-rod is kept upright. In our animation we have replaced the circular “plate C” with a crank arm in order to more clearly illustrate its motion.